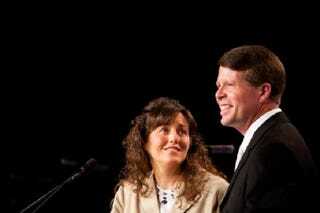 Megyn Kelly will interview Jim Bob and Michelle Duggar on Wednesday night. They are expected to discuss the recent news that their son, Josh Duggar, molested four of their daughters. Jim Bob and Michelle will also discuss the future of their TLC show, 19 Kids and Counting. Next week we will sit down with Megyn Kelly on Fox News to share our hearts with you about the pain that we walked through as a family twelve years ago, the tears we all shed and the forgiveness that was given. We appreciate the outpouring of love and prayers for our family at this time. The Jim Bob-Michelle response was inevitable, but this interview seems like it’s going to be yet another attempt to emphasize “forgiveness” for their son over the lives of their daughters. Whatever, it’s going to be terrible.